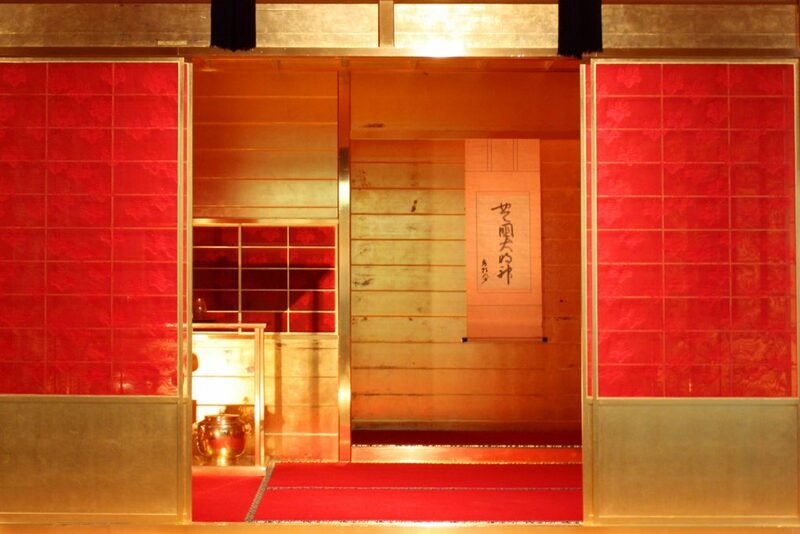 This is a faithful replica of the portable golden tea room that Toyotomi Hideyoshi had erected in the Imperial Palace in Kyoto in the New Year of 1586 in order to hold an all-gold tea ceremony for the then Emperor - Emperor Ogimachi. 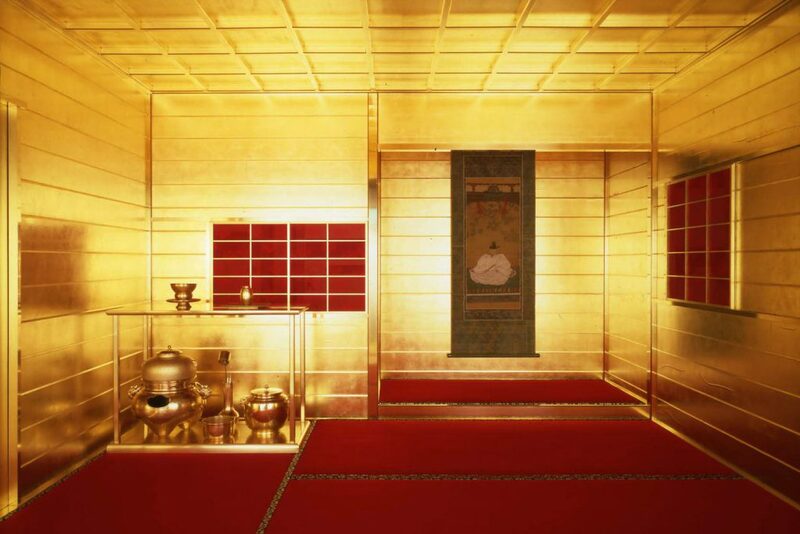 Subsequently in 1587, Hideyoshi used this golden tea room at the famous Grand Kitano Tea Ceremony, and it is known that in 1592 he had it brought from Osaka to Nagoya Castle in Hizen (today’s Saga prefecture), where Hideyoshi was commanding his expeditionary force to the Korean peninsula. 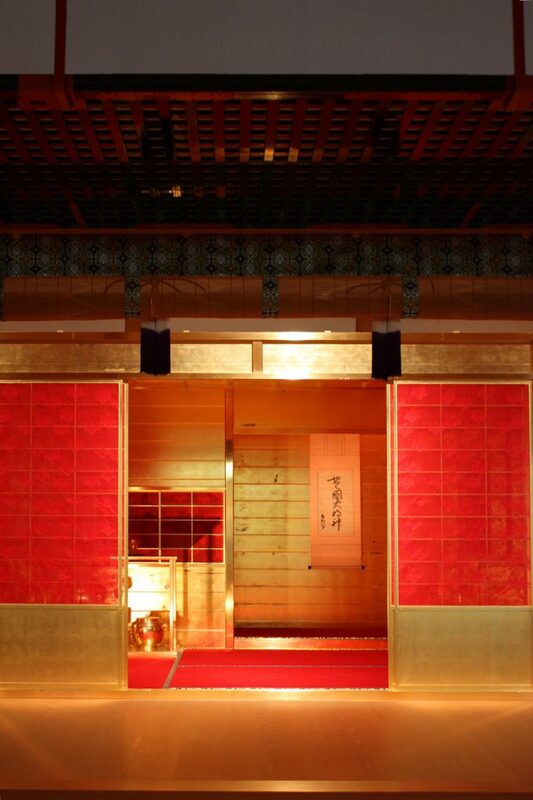 It is thought that the original tea room was lost in the fall of Osaka Castle. A visit to the tea room is a chance to appreciate at first hand the aesthetics of the Momoyama period with its contrasting features of the dazzling rich splendor of the golden world with its tranquil, restrained simplicity of the wabi style of Sukiya architecture. 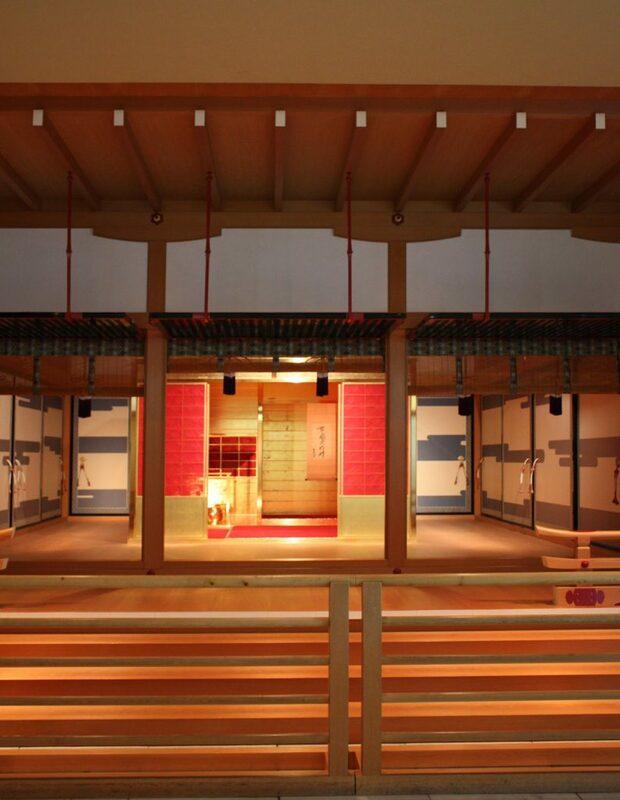 This replica was created based on the written accounts of court nobles, military commanders, tea masters and foreign missionaries, and under the supervision of the top authority in the Sukiya style of architecture Dr Sutemi Horiguchi. 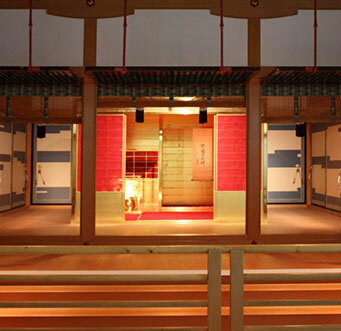 Just like the original, this tea room can be fully disassembled, and the size and mechanism of all its parts and components have been carefully calculated from historical documents. 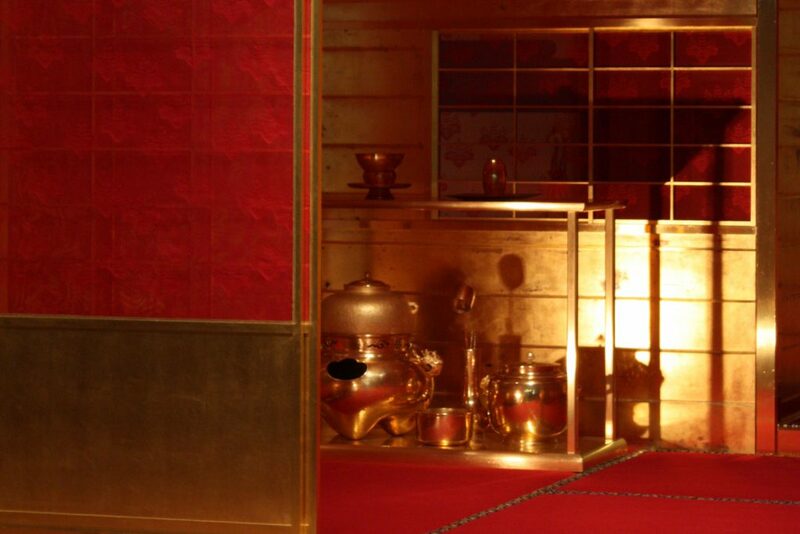 The golden tea implements have been recreated based on the set of tea utensils (black urushi daisu shelf and bronze implements from China) held by Sen no Rikyu and kept at Omotesenke tea house Fushin’an. Approximately 50 grams of solid gold is used in these implements. 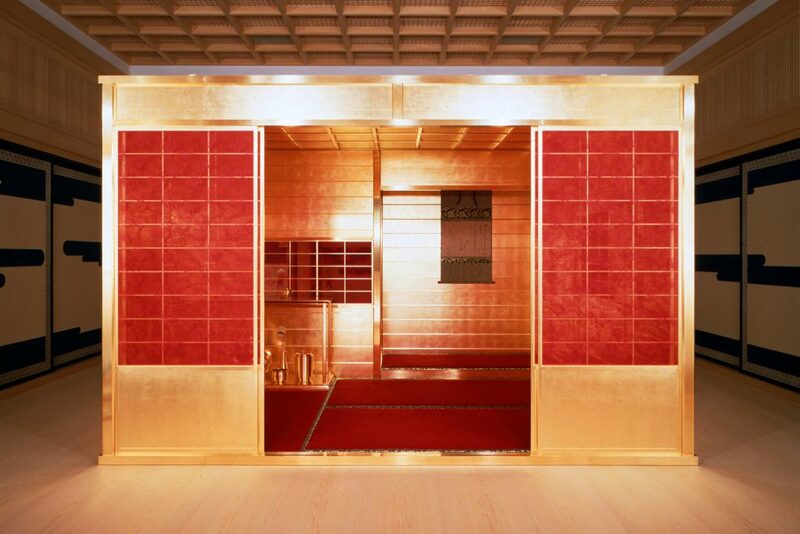 The shoji doors are applied with crimson silk with watermarked paulownia patterns, Hideyoshi’s favorite, modeled on the design used in the Koshoin of Katsura Rikyu Imperial Villa. The tatami mats in deep crimson are recreated based on the battle surcoats worn by warriors of the time.